Property Size 2,600 sq. ft. Welcome to Peace, Love and Sandy Feet. An ideal home for 3-4 families with children, or groups of 12-14 adults max. The updated Peace, Love and Sandy feet is a 6 bedroom, 3.5 bathroom Vacation Home which boasts a massive floor plan, and is ideal for groups or large families. This home features King beds, bunk beds, and sleeper sofas, which easily accommodates 8 adults and 7 small children. Our homes are kept in pristine condition. We work to ensure they are maintained to the highest standards, and pay close attention to providing desired features and amenities. We provide high speed internet for reliability and to keep your group constantly connected. Other amenities include HD cable that can be watched on our impressive flat screen televisions. We make sure to take care of our smaller guests by equipping our home with pack-n-plays and high chairs. Living Room/Dining Area: The spacious, cheery and airy Living area displays comfort and sophistication. It is adorned with regal, high ceilings and decorative crown molding. You can relax after an active day at the beach, on the comfortable sofa with queen sofa sleeper, while watching a show on the state of the art flat screen television. The living room offers open access to the dining and kitchen areas, offering enough space for your entire group to spend quality time with each other. There is abundant seating, at the 8 person dining table, as well as at the spacious kitchen counter. Kitchen: You can effortlessly prepare meals, while spending time together in the home's well appointed kitchen. The kitchen is decorated with exquisite granite counter tops, and comes equipped with a food storage pantry, and state of the art stainless steel appliances. This will be your home away from home while you're vacationing, and we aim to make sure you feel this way. We have included amenities like Professional grade cookware, for even the most complex dishes. You will also find a hand mixer for baking, a blender for smoothies, a toaster, cutlery and a set of brand new dishware. We know how important that morning cup of coffee is, so to start the day, we made sure to include both a standard coffee maker and a Keurig K-Cup coffee maker. The main level of the home includes a lavish, private master bedroom suite. Ultra soft Egyptian cotton sheets adorn the King Size master bed. The bedroom is also furnished with reading lamps and nightstands. The updated décor in this peaceful oasis features room darkening window coverings for when you want to wind down after a long day or sleep in until you feel like getting out of bed. Enjoy television on one of our state of the art HDTVs, located in the room's armoire. Bathroom 1: The beautifully designed, deluxe master bathroom is located in the main master bedroom. It features a toilet area and master vanity with dual sinks. The bath tub is ideal for an evening relaxing soak, and also includes a custom tile shower. There is no shortage of essentials such as hair dryers and plush bath towels in this beautiful Destin vacation home. A grand walk in closet is also located in the master bathroom for ample storage space. Bathroom 2: There is also a half bath on the main floor, that is located conveniently in the hallway area. This large second bedroom furnishes a brand new, elegant King size bed. You can relax from a long day, on the plush Egyptian cotton sheets, brand new pillows and vibrant quilt. The room also includes 2 nightstands with efficient reading lamps and a spacious walk in closet. It is located within close proximity to the bunk room so parents who chose to, can be closer to their children, while still being able to enjoy their private space. Bathroom 2: This massive bathroom is located in the hallway of the second floor of the house. It includes a large vanity with sink, toilet area, and a beautiful tiled tub and shower combination. A hair dryer and luxurious bath towels are stocked in this bathroom. This fun bedroom has ample space for 4 children. The full over full sized bunk beds are uniquely decorated with an aquatic theme. Kids can watch their favorite shows on the flat screen television. Living Area: The second floor of the home includes a spacious open living space, and is an ideal area for the kids and teens to hangout. The cozy furnishings include a queen sleeper sofa. Games can be enjoyed on the HD television and Wii game console. In addition, the living area includes a wet bar equipped with a mini fridge and microwave for those game time snacks the kids may need. The living area is flanked by the 2nd floor balcony and offers an awesome view of the beautiful resort style lagoon pool. Laundry Room: The Laundry area is located in the center of the home's 2nd level. You can seamlessly wash those beach clothes with the full size washer and dryer. An iron and ironing board is also available, and the laundry room also offers shelving for your laundry storage needs. This gorgeous, airy room comes furnished with a brand new king sized bed and luxuriously soft Egyptian cotton sheets. Privately access the 3rd floor balcony to enjoy day and night time views. The King bedroom also includes 2 nightstands, a dresser, reading lamps and a spacious walk in closet. It is also located within close proximity to the bunk room so parents who chose to, can be closer to their children, while still being able to enjoy their private space. This cheery King Bedroom is located towards the front of the vacation home, and includes a private entrance to the 3rd floor balcony. Plush Egyptian cotton sheets envelop the brand new King sized bed. A desk and chair is also included in the room, which is ideal for those needing to catch up on some work while on vacation. The room is also furnished with a nightstand, reading lamp, state of the art flat screen television and a walk in closet, for abundant storage. This fun bedroom has ample space for 3 children. The twin over full sized bunk beds are uniquely decorated with an aquatic theme. Kids can watch their favorite shows on the flat screen television. A large closet is located in the room, for the kids storage needs. Bathroom 4: This grand bathroom serves guests on the 3rd floor. It includes a decorative vanity with a sink, and a tub/shower combination. Plush bath towels and a hair dryer also comes stocked in this bathroom. More available linen can be found in the convenient hall linen closet. Enjoy the sparkling lagoon pool located minutes from your front steps. This resort pool is filled with 30,000 square feet of crystal clear water, and includes three waterfalls. Amenities also include a luxurious spa, where you can wind down after a long day. You can soak up the sun at the beach, which is just few short blocks away. If you are visiting during the time between Spring Break and Labor Day, hop on the free trolley instead. 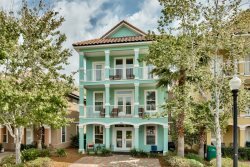 Located inside of the charming seaside town of Crystal Beach is an abundance of residences, paved trails, restaurants, shopping, and entertainment. Across from Hwy 98, you'll find plenty of upscale shopping and entertainment. We are conveniently located near Cracker Barrel, Olive Garden, AMC Theater, and more. Peace, Love and Sandy Feet has parking space for three cars in the driveway. Additional parking is available for our guests in the overflow parking lot. but it is limited. Our priority is to create memories for you and your family or group. We set, deliver and maintain high expectations. Our beautiful homes are furnished and equipped with you in mind. We are also pet friendly. Refrigerator, Stove, Microwave, Dishwasher, Coffee Maker, Toaster, Garbage Disposal, Blender, Can Opener, Mixer, Pots, Dishes, Utensils, Eat-in, Counter, Pantry & Breakfast Bar, Paper Products (limited) and Kitchen and Bath Hand Soaps. Your team was very nice. There was a gentleman that came over to fix our WiFi I think our first day there and then a few days later he came right over to put a battery in a beeping fire detector. Was very nice. They were there for us 24/7 whenever we needed anything. The staff was very knowledgeable and helpful. Check in was very simple and they allowed us to check in early which was very much appreciated. Villages of Crystal Beach is in this Area, which is our MOST recommended community. Crystal Beach is a quaint area along the Scenic beach road in Destin. You will find cozy cottages along with large yards and natural lansdcaping. The most convenient location in Destin. You are literally minutes from anything and everything you want to do!